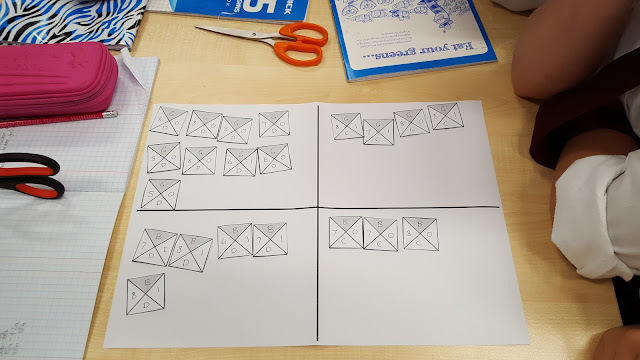 We have been using data squares to conduct statistical investigations. 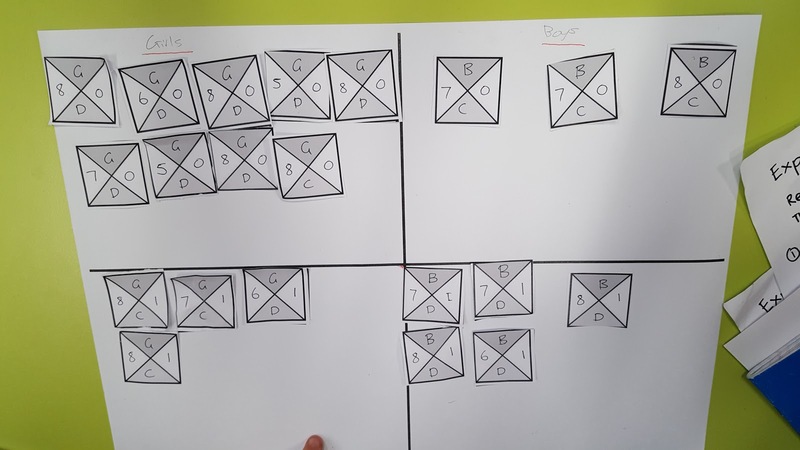 In the data square above, the person surveyed was a girl (G), who preferred the indoors to the outdoors (I), preferred dogs to cats (D) and was in year 6 (6). Investigating multiple variables allows us to explore how those variables might be related. We created data squares like the one above for everyone in our class. We then photocopied the data squares, so each team had a full set of 21 data squares to work with. Click on the images to see fullscreen versions, where you can read the data squares. Does gender affect preference for dogs or cats? All of the girls' data squares are in the top row, while all of the boys' data squares are in the bottom row. All of those who prefer dogs are in the left column, while all of those who prefer cats are in the right column. It seems that gender doesn't have much affect on preference for dogs or cats. 63% of boys prefer dogs, while 69% of girls prefer dogs. Dogs are more popular with everyone and are only slightly more popular with girls than boys. Does gender affect preference for indoors or outdoors? The girls are in the left column and the boys are in the right column. Those who prefer the outdoors are in the top row. Those who prefer the indoors are in the bottom row. The girls in our maths class are more likely to prefer the outdoors than the boys. 69% (9/13) of girls prefer the outdoors, while only 38% (3/8) of boys prefer the outdoors. One problem with our data is that there are 13 girls and only 8 boys. The larger sample size of girls means that they are better represented than the boys. It is also a very small sample overall, with only 21 students. We discussed the possible causes of this correlation between gender and preference for the outdoors. One possible explanation is that more of the boys liked video games, which are played indoors. We worked in pairs to develop our questions and generate predictions. We then gathered our data. Each team had 20 data squares because there were 20 of us in the room. After exploring some of the other data, every team chose to focus on gender (girl or boy) and one other variable. 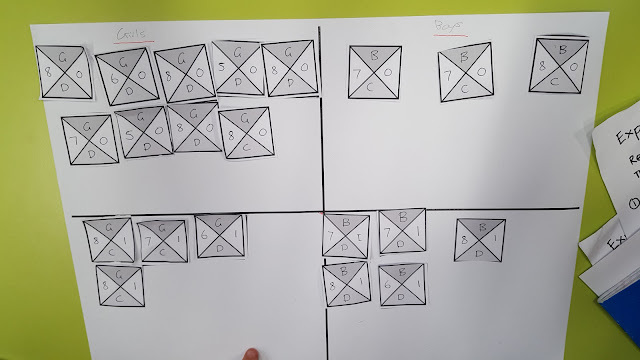 All responses were simplified into either/or categories, so we could organise the data squares on a grid.